April 18, 6:30 at Killingworth Library. 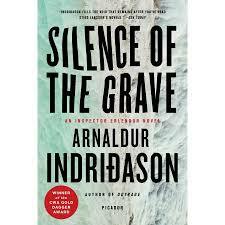 Join us as we discuss Silence of the Grave by Arnaldur Indridason. A corpse is found on a hill outside the city of Reykjavík, and Detective Inspector Erlendur Sveinsson and his team think the body may have been buried for some years. While Erlendur struggles to hold together the crumbling fragments of his own family, slowly but surely he finds out the truth about another unhappy family. Few people are still alive who can tell the tale, but even secrets taken to the grave cannot remain hidden forever. Extra copies will be available at the circulation desk. Newcomers always welcome!